As usual, there is a lot to report to you regarding Lake County Government and your Forest Preserves. The Lake County Division of Transportation announced the 2016 road contruction plan which includes 22 projects, many of which contain sidewalk connections, bike paths, or adding bike friendly lanes. Below you can read about a partnership between several government agencies to provide paratransit throughout Central Lake County for our seniors and disabled persons. Public Works has been working on transitioning from well water to Lake Michigan water for customers in Arden Shores North through an agreement with the City of North Chicago. We also receive many questions regarding the safety of our drinking water. You can read a list of Frequently Asked Questions or watch a short video that outlines what we do to keep our water free of contaminants. The County Clerk's office was extremely busy preparing for the March primary election, during which over 190,000 votes were cast at 122 polling places, a record turnout. 4,000 people were also registered to vote on Election Day, which is a first for Lake County. At your Forest Preserves, we're using 2008 referendum acquisition dollars to purchase additional property, including the Cuneo property in central Lake County, growing the Ray Lake Forest Preserve to over 1,000 acres. We're tackling one of the largest invasive species projects in Lake County-the eradication of buckthorn-with the help of private donors and nonprofit organizations, and working with many partners in the Chicagoland area on an Oak Ecosystems Recovery Plan and the reintroduction of native species. On April 21st at 7:00pm at the Lake Bluff Library I am presenting the 2040 Lake County Bike Plan and showing some great trail rides that wind through our beautiful forest preserves. I hope to see you there. As always, it is a pleasure to serve you on the Lake County Board and the Forest Preserve Board. If you have any suggestions, questions, or comments, please don't hesitate to contact me. The Army Corps of Engineers (ACOE), Lake County Forest Preserves, the City of Lake Forest, Lake Forest Open Lands, and Openlands are collaborating on a large-scale Great Lakes Coastal Ecosystem Restoration Project that spans across eight states.This project has several goals, including protecting, restoring and maintaining fish and wildlife habitat; restoring threatened and endangered species to self-sustaining levels; and protecting, managing, and conserving migratory birds. Extensive construction and restoration work will be conducted in the uplands, ravines and along the shore in Fort Sheridan. As a result, THE LAKESHORE IS CLOSED TO THE PUBLIC THROUGH OCTOBER 2016. As habitat restoration proceeds, we can expect to see brief, intermittent closures throughout the preserve through 2018, with additional short closures for maintenance through 2021. Signage and fencing is and will be placed in closed areas for public safety and to provide information about this important project. You can check the status of construction work and closures within Fort Sheridan Forest Preserve, and for more detailed information about this project please call Gene Fleming (ACOE) at 312-846-5585, or you can email him. The improvement of transportation in and around Lake County is one our most critical goals, and this includes public transportation. For several years, Shields Township has been the only area in all of Lake County that has not offered area-wide transportation for seniors and persons with disabilities. After working together for many months, Shields, Libertyville, and Fremont Townships, in collaboration with PACE, RTA, Lake County, and the Villages of Mundelein and Libertyville, have come together to form an expanded service area to meet the transportation needs of our residents. Seniors and disabled adults can now reach College of Lake County, Vernon Hills, medical offices, and places of employment using this new curb-to-curb service. Please note that this service can also be used by persons experiencing a temporary disability due to an injury. While this is an enormous step in expanding public transportation, we must continue our work on created a coordinated, county-wide paratransit and public transportation system throughout Lake County. Overlapping services and disconnected areas of transportation cost much more, and we are actively working with PACE, RTA, and other government agencies on one seamless system to best serve our residents most efficiently and cost effectively. As we approach Earth Day on April 22nd, the Lake County Forest Preserves offer activities all week to celebrate, including bluebird hikes, bat monitoring, walking with medical professionals, and meeting the animals used in our educational programs. On April 22nd at Rollins Savanna there is a restoration workday with Lake County Veteran & Family Services and a BBQ to follow. I hope that you will consider getting out on some of our great trails throughout Lake County. Please note that with the spring rain, some trails may flood. You can check the status of trails and preserves to make sure that your trail is accessible. The Chief County Assessment Office and the Lake County Township Assessors Association will hold several public outreach sessions to assist residents in completing the 2016 Senior Citizen Assessment Freeze Application. Watch this video to learn more about the upcoming outreach centers as well as learn where to download the form and get instructions to help fill it out. The deadline to submit the form is July 1. The Secretary of State’s office will no longer send annual license plate renewal notices. While this may be a minor inconvenience, this seemingly small change will save Illinois $450,000 per month. The Illinois EPA has also suspended the mailing of emissions test notices. To receive an email notification, register here. (you will need your Registration ID and PIN, which can be found on your paper vehicle registration form). If an emissions test is required, you will be notified via the electronic license plate renewal notice. Vernon Hills Police Department (490 Greenleaf Drive, Vernon Hills) is offering a low-cost pet vaccination clinic to provide a convenient and affordable way to keep your pets up to date with their shots and rabies tags. Pets are taken on a first come first served basis. All animals brought to a clinic must be at least four months old. Dogs must be leashed and cats placed in carriers. Only cash will be accepted. Click here for more information or call 847-377-4700. Many of you have reached out to me regarding your concern with the discontinuation of the electronics recycling program scheduled for May 1. To give you some background, SWALCO has been subsidizing this program with local tax dollars since mid-2015. In the past, the program was paid for using funds collected by the state through fees imposed on electronics sold in Illinois. Because TVs and other items have gotten lighter, and the commodity market for the recycled goods has declined significantly, what once was a revenue source for the county and municipalities has become a major expense. A legislative change must occur in Springfield to correct the fee structure so that this program can continue. Since it is illegal to dispose of electronics in our landfills, we are seeing people leave TVs in roadside ditches as sites close. In the meatime, several municipalities have stepped forward to offer more local dollars to keep this important program in place. This is a complex issue and one that we are closely watching as we advocate for change at state level. Watch this video​ to learn more. In late January, I and several other volunteers participated in a national project to find, count, and offer shelter to persons who are homeless. This Point-In-Time Count, conducted across the country, gives us information on how many people are unsheltered at one point in time, and helps us better understand how our population changes in terms of need, numbers, and trends so that we may deliver services better. Divided up into teams, we fanned out across Lake County to truck stops, train stations, underpasses, 24-hour businesses, and hospitals. Unfortunately, we found more unsheltered persons this year than last, which include people suffering from mental illlness. The information is gathered and is used in grant requests for funding for emergency, temporary, and permanent housing. Watch this video to hear from some of the volunteers and to learn more about this year’s Point-In-Time Count. Every year, the Lake County Board reviews State House and Senate bills to evaluate which ones we should support, oppose, or watch by determining the cost impacts to the county and therefore, the taxpayers. We also work with local state legislators to introduce new legislation that would save taxpayers money. An example of this is legislation crafted by the Lake County Forest Preserves in 2015 to amend the Property Tax Code so that the tax extension more accurately reflected the tax levy. Before this legislation, governmental agencies rounded up the tax rate, thereby receiving more in taxes than what was actually needed to operate. This year, Lake County is working with local legislators to pass legislation that will enable the Lake County Board (as is done in DuPage County) to consolidate certain units of local government, such as the 70 agencies to which the County Board appoints nearly 300 people. As you probably know, Illinois has more taxing bodies than any other state in the nation and has the second highest property taxes (behind New Jersey). Click here to view the 2016 Legislative Program to read those bills that Lake County supports at state and federal level. Did you know that landscaping your yard with native plants is one of the best things to do for the environment while also saving time and money? View a list of Lake County flowers, shrubs, vines and trees. 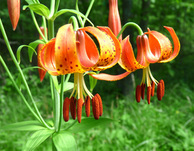 Native plants don’t require fertilizer, pesticides or herbicides and eliminate the need for a lot of watering. Learn more about native plant landscape design and maintenance.